Dupuytren's contracture is a condition in which hand tissue thickens and tightens. Ultimately, patients with this condition have difficulty moving their fingers. In Dupuytren's contracture surgery, that tissue is removed to restore mobility. You stretch your hand open but, no matter how hard you try, one or more of your fingers stays stuck in a bent position. This can make everyday tasks seem difficult. You may have a usually painless but inconvenient condition known as Dupuytren’s contracture. In this guide, we’ll explain this condition and how it is treated. What are the stages and symptoms of Dupuytren’s contracture? Are there non-surgical treatments for Dupuytren’s contracture? What is involved in recovery from Dupuytren’s contracture surgery? Dupuytren’s is a hand deformity in which knots of tissue grow beneath your skin to form a firm cord along your finger. This keeps your finger from retracting and extending normally. In its later stages, the tissue cords from your Dupuytren’s may sometimes tighten at seemingly random times. This forces your fingers back toward your palm. While it usually doesn’t cause pain, Dupuytren’s contracture can be disruptive to everyday life, which is why you want to learn about its stages and your treatment options. 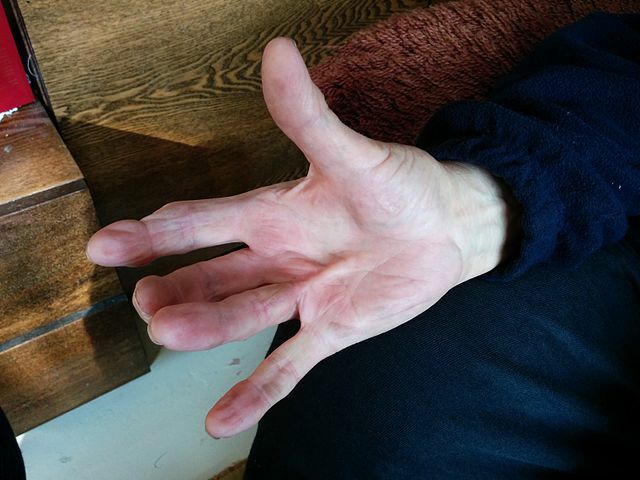 Dupuytren’s contracture can be seen on the ring finger in this photo. The condition prevents the person from fully extending her finger. In most cases, Dupuytren’s contracture progresses slowly through its stages. At first, you may see or feel only a slight change. The skin on your palm may feel slightly thicker. Over time, that thick skin may develop an uneven texture, with wrinkles and pits that do not match the ones on the rest of your hand. Eventually you may develop a hard lump under your palm skin. When you try to rest your hand flatly, the shape of the firm mass will make it difficult to press your palm down on a surface. Dupuytren’s contracture does not always progress, so having a mild case does not necessarily mean you will someday experience advanced stages. But in advanced Dupuytren’s, the lump grows to form a thick cord that extends from your palm to your fingers. Your cord may run to just one finger, or it it may reach two or three. The condition is most common to the outside of the hand, along the ring and small fingers, and sometimes extending to the middle finger. Some people experience Dupuytren’s in just one hand, but many others have it in both. No one knows the exact cause Dupuytren’s. Some in the medical community have speculated that overuse of the hand and tasks involving excessive vibration lead to Dupuytren’s. There is not much evidence to support those suggestions. Yes. Dupuytren’s is incurable. However, there are surgical and non-surgical ways to restore movement in your hand so that you can complete everyday activities. If your Dupuytren’s is not severe, and you are not in pain, then your doctor may opt for the way-and-see approach of continual observation. Another non-surgical option for Dupuytren’s is a corticosteroid injection. This treatment is popular for people who feel pain from Dupuytren’s. The steroid is an anti-inflammatory, which lessens pain and slow the growth rate of your contracture. If the contracture in your hand is hindering your everyday tasks, then your hand surgeon may recommend surgery. Removing your contracture does not rid you of the disease — you have the risk of forming contracture in the future. It does, however, reset the timeline of your condition and returns your motion and function. One of your surgical options is to have the thick cord of tissue in your hand cut into multiple pieces. The cord is not removed. But by being divided, it cannot restrict your motion the way it does as a long band. If the wound from your surgery is large, then your surgeon may have to graft skin over the exposed area. In most cases, your recovery involves wearing a splint while the wound heals gradually. This procedure has a more complicated recovery process. Recovery is likely to involve not only a skin graft but also physical therapy. Although Dupuytren’s is incurable, surgery for the condition has a high rate of positive outcomes. The vast majority of people who have Dupuytren’s surgery regain much of the movement in their fingers. Very few of these patients require follow-up surgeries. But additional procedures are an option for people who see their contracture return. Once you have surgery for your Dupuytren’s contracture, the only remaining stage is your recovery. In the first week or two after surgery, you may have pain, swelling, tingling, or numbness in your palm and fingers. Over-the-counter pain medicines should address the sensitivity. Two or three weeks after your procedure, your hand surgeon will remove any stitches used in your surgery. Following surgery, you will likely have to wear a hand splint for two to four months. You may also need hand therapy for six to 12 weeks to get strength and movement back to your hand as soon as possible. Any tissue scarring from your Dupuytren’s surgery should diminish within a year or so. While Dupuytren’s is surely an inconvenient condition, your treatment will allow you to enjoy the use of your hands without restriction. The skilled hand surgeons at Michigan Surgery Specialists have treated many cases of Dupuytren’s disease. We can help diagnose your condition and give you a pathway to less pain and better function. Make an appointment with Michigan Surgery Specialists to learn more about your condition and how it can be treated.